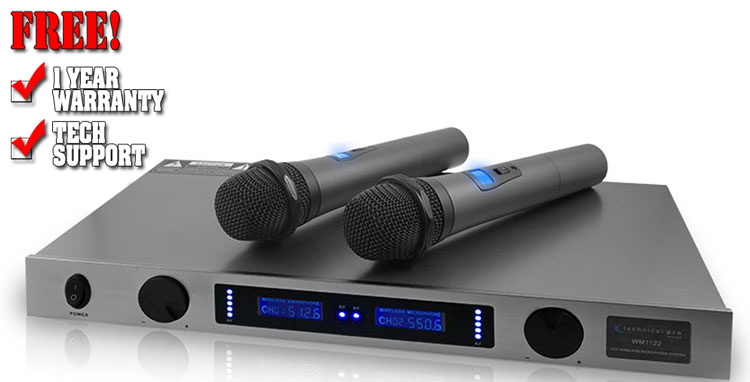 The Professional UHF Dual Wireless Microphone System is the ideal system for public event venues and DJs who run karaoke nights. You don't get tied down with mic leads using this system, but you do get 2 microphones so John Travolta-likes and Olivia Newton John-wannabes can let rip with their Grease covers without the risk of a tangle. The sound gets from the microphones to the amplifier via a wireless ultra-high frequency signal that uses an FM modulation for clarity. On arrival at the amplifier, the signal is cleaned of any interference through conversion to digital coding. The amplifier uses other clever technology to eradicate the annoying popping sound that sometimes bugs wireless mics. It also has an automatic cut off to prevent static noise that occurs when mics go out of range. That serviceable range is 200 feet. The sound quality of the amplifier is ensured with a frequency response of 40 Hertz-20 kiloHertz, which is within the range of human hearing. The signal to noise ratio is 101 decibels. You can have up to 20 different microphones in one location by installing 10 different sets. The amplifier is made of sturdy metal, painted light gray, with black dial controls. The twin display panels are black with luminous blue figures. Each of the two displays shows the volume reading for each microphone. Technical Pro is well-known for the quality of its products, producing rugged, durable equipment, and the wireless microphone system is a good example of those high standards. The unit exemplifies the company's commitment to innovative design and quality production.